Get the 2-Car Garage DIPA. Stop what you are doing, and get to the Purgatory Beer Co. now. Thank us later. Step inside, walk this way. Where is Purgatory Beer Company located? 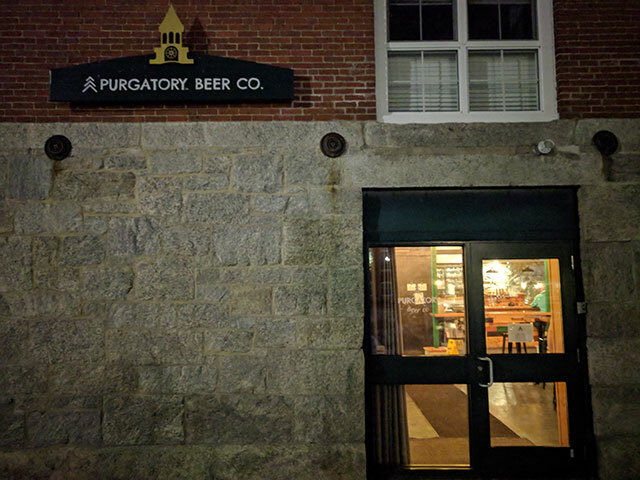 The Purgatory Beer Company can be found in Whitinsville, a part of Northbridge, MA. Presumably, the beer company is named after Purgatory Chasm, a state reservation featuring hiking trails that is right off of route 146. Awesomely enough, the folks who live in the Blackstone River Valley National Heritage Corridor now have access to some local brewed beer. Towns like Uxbridge, Mendon, and Sutton. They recently celebrated their first anniversary, opening in November of 2017. And as far as google suggests, they are the only company in Blackstone Valley brewing craft beer. Always good to see some lively business in the 01588, adding jobs to the community. 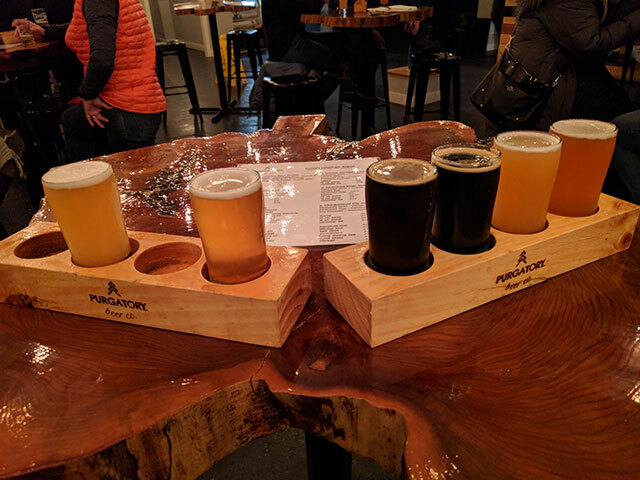 When should I visit the taproom? Heading to the Southwick Zoo? Hiking around Purgatory Chasm? Perhaps you are returning from dropping your child off at Bryant University over the RI line. Even if you’re just headed to a beer store in Sutton, consider stopping here instead. I guess it’s possible. 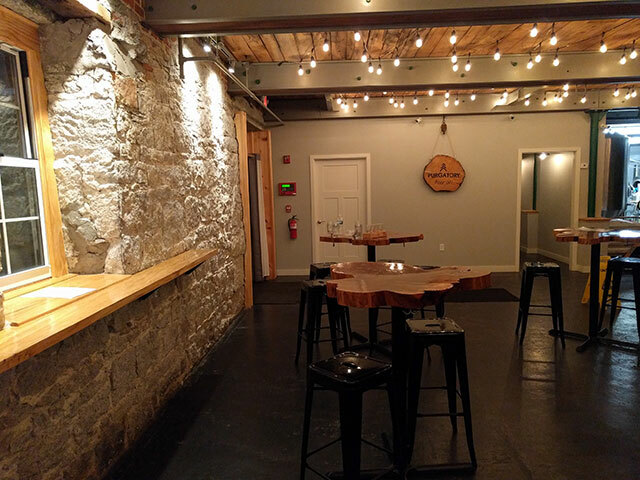 The entire brewing operation can be seen from inside of the taproom. Yes. It’s also dog friendly, that’s for sure. 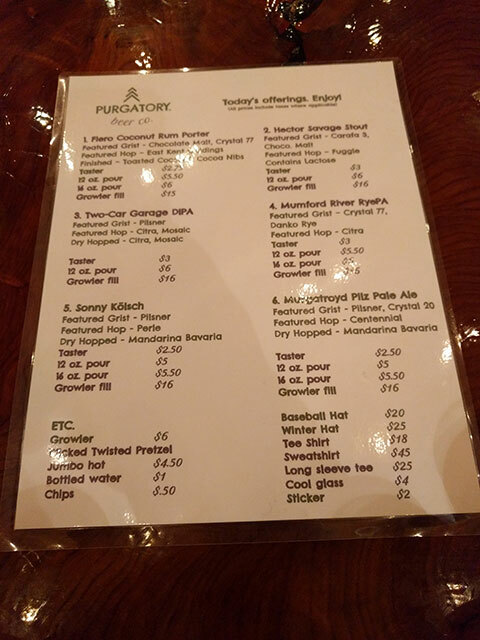 What types of beer does the Purgatory Beer Co. brew? The two-car garage DIPA was outstandingly delicious. The Sonny Kolsch was the best Kolsch I’ve ever had. And, I was very satisfied by the Fiero Coconut Rum Porter. A growler of that will keep you warm at night. Other beers on tap included the Hector Savage Stout, Mumford River Rye PA, and the Murgatroyd Pale Ale. All rock solid craft brews. They do make an effort to swap out a tap monthly. Just missed the Double Dutch “Autumnal” Brown Ale. That sounds pretty rad. Guess who’s got a Fall Release. Of course we do. Pumpkin? Of course not. Double Dutch “Autumnal” Brown Ale. is a traditional Brown Ale, dry hopped with not-so-traditional graham crackers. It's like an apple pie stuffed with a sweet, delicious crumb cake. Yum. I don’t believe so. It’s not a bar, it’s just a small establishment selling their own beer. Yes to flights. In fact, you can rock a 6 beer flight. 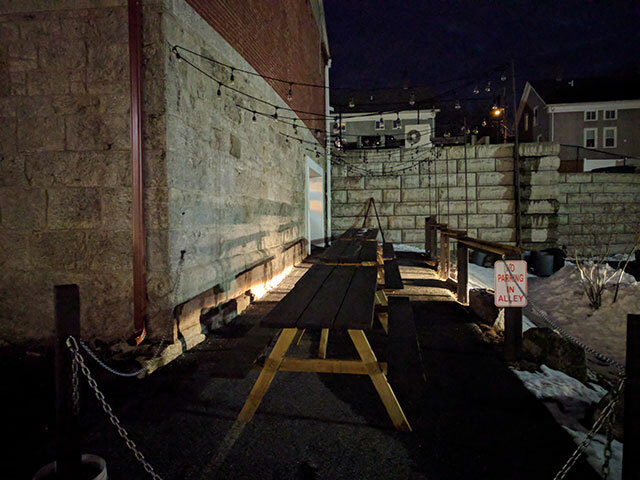 With the extra 2 sample pours beyond the standard 4, and with high ABV beers like the 2 car DIPA, you might want to stick to just getting a taste of their delicious beer before driving out of this, in no way public transportation accessible, remote corner of of Whitinsville. Growlers are the only thing you can leave with. It seems they only can in limited quantities. All six on tap! Line them up! T-shirts! At this point, I’d imagine craft beer lovers could wear all of their favorite microbrewery t-shirts for a month and not repeat a shirt once. Does the Purgatory brewery serve food? Pretzels! They have menus for local takeout and pizza shops. Anzio’s Pizza of Grafton sets up their mobile brick oven just outside of the taproom. Additionaly food trucks like those from Pangea Cuisines in nearby Holliston make appearances. They have musicians come by every now and then. They wheel in a big flat screen for big games like the Sox in the World Series and Sunday NFL football. And what bar/brewery/taproom would be complete without bar trivia? They host trivia nights, but I’m not sure what the schedule is, do your own research. They do host private events, not sure if that’s for themselves, or if they will rent out the space for your company’s Holiday party. Probably worth checking in with the owners. Can I buy beers in stores? No. Purgatory beer can only be purchased on-site. If you like the sound of running water while you are drinking outdoors, then the Purgatory Beer Co. is for you, as the Linwood Pond empties into the Mumford River. 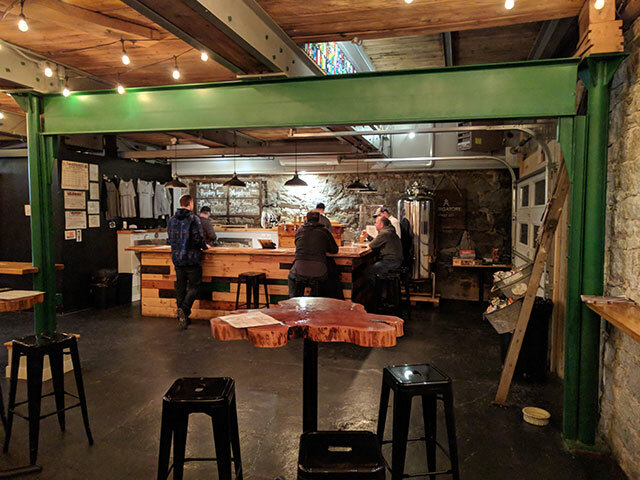 The taproom reminds me a lot of [Shackett’s Brewing]() in NH in that it has all of the elements - good beer, good ambiance, good decor/construction, and, they conveniently both have rivers directly behind them. We are outdoorsy in that we like to drink on patios!